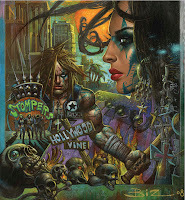 Publisher IDW brings a new tale of post-apocalytic LA to the world of comic books from the mind of Kevin Eastman (and Simon Bisley and Joe Pearson too!). You could probably call Lost Angeles 'The Road Warrior meets Romeo & Juliet' pretty safely. Taking place after a comet narrowly misses the Earth, LA finds a future world that's besieged with disasters and turmoil... and a love story? Things in one of California's biggest cities, Los Angeles, have especially gone down the tubes as vicious gangs have taken over and locked horns in a constant and never-ending battle for turf. And it's in the middle of all this that the starring duo of Mikal and Angel find their story playing out. When all hell breaks loose following a massive comet’s near miss, the sprawling metropolis of Los Angeles is irreparably fractured and claimed by legions of brutal gangs. Perpetually turf-thirsty bands of fierce warriors fight day in and day out to claim blood and respect across swaths of scarce land, battered by cosmically twisted disasters. As civilization recedes into uncompromising tribal life, an anomaly surfaces: two rival gang members, Mikal and Angel, find themselves in the throes of a comet-crossed love affair. Threatening to tear their respective clans apart from within, their love becomes the centerpiece to all-out gang war as LOST ANGELES reaches its fever-pitched conclusion over six issues. "I am THRILLED to be back at the creative table with my good friend Simon Bisely, and the very talented Joe Pearson--this is one of the coolest projects I have been involved with in a great many years--and my first solo art project in more than two decades!" explains Kevin "I can wait to show the fans what I'm going to do he--my career as a artist is about to go into high gear!" Look for Lost Angeles later this year.